I need to do a fresh install of Windows 7. however the product key sticker is worn off to badly on the bottom of my laptop and can not be read. Is there a way out to get Windows 7 product key from my Windows installation? Normally the product key could be located either on the Windows installation CD case or on the top/bottom of your machine. What to do if you have misplaced the installation CD or the product key sticker is worn out? Fortunately you can extract and get Windows 7 product key from your Windows registry. Windows 7, like any other versions of Windows, stores the product key inside the Windows registry, but it is in an encrypted form that is totally not understandable. This is where Product Key Finder program comes in. 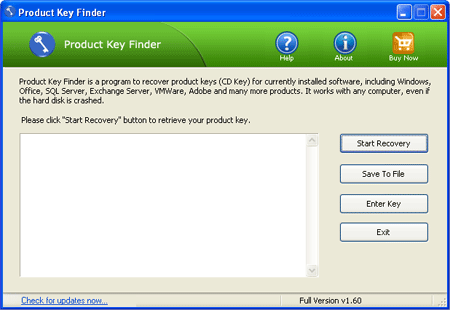 Product Key Finder is a useful program which decrypts and retrieve Windows 7 product key easily. In this tutorial we’re going to walk you through how to find Windows 7 product key from registry. How to Find Windows 7 Product Key from Registry? Once you’ve chosen the first option, the program will automatically search the Windows registry on your local computer, and then decrypt and find your Windows 7 product key immediately. If you need to find Windows 7 product key from a crashed or unbootable computer, choose the second option. It will require you to locate one of your Windows registry hives which is copied out from your crashed or unbootable computer. Click OK and it will display your Windows 7 product key in seconds. The third option offers you to find Windows 7 product key from a remote computer. In order to obtain remote access to the Windows registry, you need to know the IP address and Windows logon credentials. Besides finding Windows 7 product key, Product Key Finder can also help you retrieve lost Windows 8, Vista and XP product keys. After getting your lost CD keys, I recommend you print it out and put it somewhere safe. Ever been in situation where you need to re-install Windows 7 or the system is crashed? It must be a frustrating experience when you found out that you can’t locate Windows 7 product key because the product key sticker has been scratched and damaged. So now what to do, How to recover or find your lost product key? Yes you can do that with simple and easy steps, there is a professional key finder program called Product Key Finder, which will help you to find Windows 7 product key from your current computer. How to Find Windows 7 Product Key from Your Current Computer? Download and install Product Key Finder on your computer. Launch Product Key Finder and click the Start Recovery button. It will bring up a drop-down menu that provides three recovery mode: From current system, From non-booting system and From remote computer. To recover product keys from your current Windows installation, choose the first recovery mode. The program will scan your Windows registry and find your Windows 7 product key immediately. Note that you need to run the Product Key Finder program before formatting the system. If you format the system and try to retrieve the keys, you would find nothing as the registry would be completely fresh with no data stored. Hence, make sure to recover/find your Windows 7 product key in advance and print a hard copy of all the serial keys and keep it in your shelf.